The interplanetary dust particles that fall to Earth from outer space apparently come from comets, according to the latest findings from Europe's comet-chasing Rosetta spacecraft. This discovery could shed light on the origins of Earth and the rest of the solar system. In August, the European Space Agency's Rosetta spacecraft became the first probe ever to orbit a comet; in November, it became the first to land a probe on a comet. Rosetta and its target, Comet 67P/Churyumov–Gerasimenko, are currently about 318 million miles (513 million kilometers) from Earth. As the orbits of comets bring them near the sun, their ice sublimates, or turns directly from solid to gas. The closer the comets get, the more gas they give off, and the more dust gets freed from the ice, as well. As the orbits of comets bring them away from the sun, the flow of gas from the objects slows down. This eventually means any dust lifted up to a comet's surface by gas leaks gets trapped on the comet instead of escaping. "There is eventually not enough gas pressure for the dust particles to get away, stranding them on the comet's surface, and they build up a dusty layer called a mantle," Schulz said. Rosetta has been collecting and analyzing grains of dust flying off Comet 67P/Churyumov–Gerasimenko using the craft's COSIMA instrument. The comet takes about 6.5 years to complete an orbit, and in the fours years of that orbit the icy body spent away from the sun, it built up a mantle. Now the scientists find that comets such as 67P/Churyumov–Gerasimenko "are the apparent origin of interplanetary dust particles," Schulz told Space.com. Interplanetary dust continually rains down on Earth and other solar system bodies. 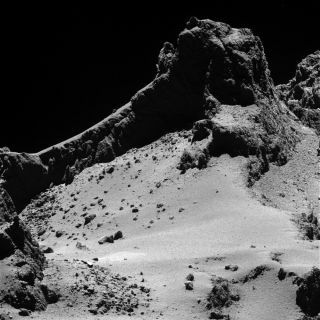 This image shows so-called "fluffy" dust grains from the Comet 67P/Churyumov-Gerasimenko as seen by the COSIMA dust experiment aboard the European Space Agency's Rosetta spacecraft. Rosetta began collecting grains of dust from the comet about 3 astronomical units (AU) away from the sun, or about three times Earth's average distance from the sun. When the comet got between 2.5 and 2.7 AU from the sun, its dust production doubled, suggesting that this was when the object shed its mantle. These grains are fluffy, being more than 50 percent hollow. Many shattered when collected, suggesting they are conglomerates of smaller grains, likely about the same size as interplanetary dust particles. Rosetta found that the fluffy particles are rich in sodium, much like meteoroids from comets that fall on Earth, such as the Leonid meteor shower that recurs every November and originates from Comet Tempel-Tuttle. "This all suggests that comets are the parents of interplanetary dust particles," Schulz said. About 30,000 to 40,000 tons of interplanetary dust fall on Earth per year. "Interplanetary dust brings material to the Earth all the time," Schulz added. "It's important to learn more about interplanetary dust to learn more about how the solar system formed. "The scientists detailed their findings online Jan. 26 in the journal Nature.